I do not find my child’s school bus listed. How do I get that added? 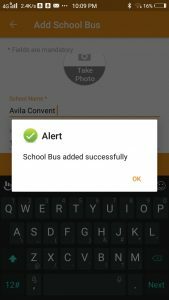 If your child’s school bus is not listed, it is most likely that it has not been added yet. In that case, you will be required to add the school bus. This can be done by clicking ‘Add a New School Bus’ button. 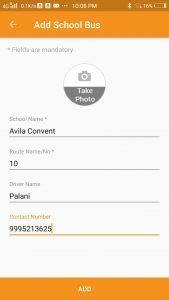 In the ‘Add School Bus’ screen, please specify the details and click the ‘Add’ button. I would like to communicate with other parents residing in my community following the same bus route. Is it possible? How can I edit/modify details of a school bus? 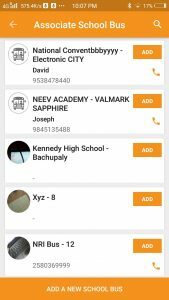 How can I get alerts/notifications when my child’s school bus arrives at main gate of my apartment? Where can I see the movement details of a specific School Bus?